As Spring starts to arrive one of the drawbacks to New York apartments is the lack of outside space. Located in 145 President Street in Carrol Gardens is a beautiful 4-bedroom apartment with a private 2,000 square foot garden terrace for $3.795 million. Won't you take a look? Highlights include three exposures (South, North and East), a living/dining area measuring almost 34 feet wide by over 14 feet deep with corner wrap around floor to ceiling windows leading to your private terrace, an oversized kitchen, separate laundry room and gracious foyer entry. Well-appointed kitchens showcase custom Italian white oak cabinetry with blackened brass pulls and Tundra Gray slab marble countertops and backsplash. Though intimate in size, 145 President offers a substantial amenities package that includes 2 large rooftop terraces with views of the Manhattan skyline, Statue of Liberty and the New York Harbor. 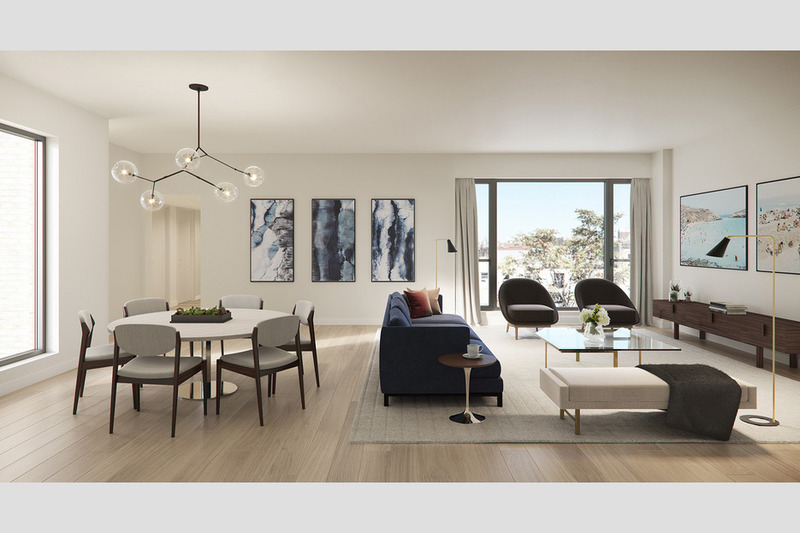 Residents will also have access to a fitness center which includes a Peloton stationary bike, a virtual doorman, a package room and a private storage unit for each home. On-site indoor parking is also available for purchase. The building is 145 President -- a collection of seventeen residences set amid the historic townhouses of Carroll Gardens. With a Scandinavian-influenced material and color palette, residences blend natural warmth with sophisticated modern design. Price start at $2.295 million. The building is developed by Avery Hall.